Join us for an exciting family fun event at the Pool At MCBH. 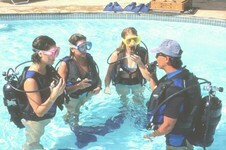 Includes: lesson, all equipment, instruction and snacks. ome see what all the hype is about. *There will be a $20 registration fee. A $20 training credit will be issued to each participant that can be applied towards the Open Water Certification course. Ages 10 and up welcome to attend. Limited Space is available! Call 808-923-3483 to sign up now!